Signage dimensions are 540mm wide by 845mm high. We recommend Foamex or Coreflute as a signage material. You will require velcro dots to attach signage. Let us know if you would like a quote for a custom sign for your event! 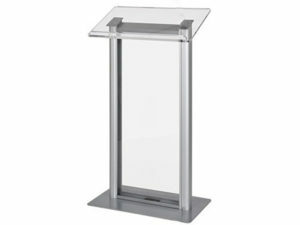 Stylish, Silver and Perspex Lectern - great for Gala Dinners or social functions where you really want to stand out! Not suitable to carry signage - but why would you want to hide that sleek look! Please provide any additional information such as setup time, event location, etc. If you’ve got an upcoming event or presentation and you want it to both look professional and go as smoothly as possible, you need reliable audio visual equipment. We all know that the whole point of a lectern or podium is to provide a focal point for the presentation and to provide a place for you to rest your notes, if you have some. However, we also know that your lectern is the perfect place to promote your business or message so we’re more than happy to attach your custom signage to the front of the podium when you rent a lectern from us. If you’re unable to provide your own signage, we can provide that too. That’s why we’ve got a reputation for being the number one place for podium and lectern hire in Sydney, and that’s why our customers come back to us time and time again. 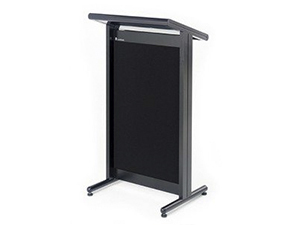 Whether you’re simply looking to hire a lectern in Sydney or you need the full range of audio visual equipment, as the leading supplier of AV equipment in the city, we’ll have everything you need, and more. With over 20 years of experience in hiring AV equipment to all manner of businesses, both small and large, we understand how important it is to have the correct, fully functioning AV systems for your event. That’s why we only invest in the best possible equipment and why we set it up ourselves so that it’s ready to go. When you choose our lectern hire, not only will we deliver our professional lectern direct to your event, but we’ll also ensure that the 2 lectern microphones are fully patched into your existing PA system so that they won’t let you down at a crucial moment. Should you require one of our audio PA kits to ensure that your lectern performs to the best of its ability, we’ll be more than happy to provide that too. So, as you can see, we do everything we can to ensure that we offer the kind of lectern hire in Sydney that even organisers enjoy. If you’d like to know more about any of our audio visual services like PA Systems Hire, Microphones Hire, Projectors and Screens Hire in Sydney or you’d simply like to hire a lectern, Sydney based CDS Audio Visual would love to hear from you. We can provide free no obligation quotes for our equipment hire, together with any advice you may need on choosing the best AV equipment for your event or conference. Call us now on 1300 852 552 or complete our online contact form.